THE iconic early 1980s film and TV series Fame was set at a performing arts school in New York. It featured a glamorous, multi-ethnic cast of hopefuls sporting gaudy leg-warmers and bad hair. Unless you have a fetish for fashion blunders from bygone decades, you'll probably remember it chiefly for its chart-topping theme song. But its influence runs deeper. Fame is an obvious ancestor of the now ubiquitous TV talent quest format. Like Australian Idol and So You Think You Can Dance?, it proceeds from the notion that artistic talent is like lightning: striking blind to class, race or creed, and that melodramatic mileage can be made from the hard yards required to harness that electricity. No coincidence, then, that stars in the Australian production of Fame: the Musical got their break as talent quest contestants. Despite its shortcomings as musical theatre, the show is a high-octane rocket ride, fuelled by the energy and skill of a youthful cast. The highlight of Fame: The Musical is Kelley Abbey's extravagant, culture-hopping choreography, performed with dynamism and grace. The dance draws inspiration from every corner of the globe: from the strength and delicacy of Talia Fowler's classical ballet routines, to sharp urban break-dancing from Timomatic. Some of the most effective and spectacular dance comes through big-scale chorus numbers: an elaborate Argentine tango that sees the whole stage surging to Latin rhythms, or the modern pop choreography made famous by the movie, complete with acid wash jeans and Bedazzled crops tops. The performers tend to be stronger at either dance or song. Timomatic and Rowena Vilar are astonishing dancers but stumble to belt out their solo vocals. For others, singing is their forte. As a top-heavy dance student, Jaz Flowers brings the house down with a comic, gospel-inspired pastiche. Boy, does she have some pipes on her. The volume is cranked up to dramatic effect in a turbulent soul duet between two teachers (Darlene Love and Rebecca Jackson Mendoza). The Broadway ballads are sung with clarity and emotion by Chris Durling and Catherine Shepherd, though they're a bit hamstrung by lazy lyrics and formulaic melodies. I was sometimes more impressed by small, inventive flourishes than the main songs - a doo-wop trio singing the Fame theme in a segue between scenes, for one. 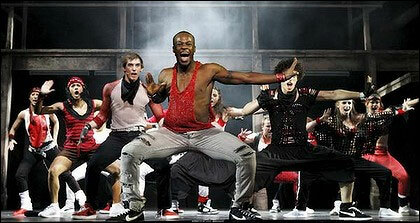 Fame: The Musical has its problems, but this production throws everything at it. The result is a spectacular and entertaining celebration of youth, ambition and creative talent.